In this class, we talked about how story breaks, shifts and changes can change your valuation. Since some of you will be dealing with new earnings reports, I thought you may find these two posts of interest in how narratives shift, and with them, values: Reacting to Earnings Reports; Narrative Resets. We started with two conventional valuations, one of Con Ed, another of 3M. So one thing I'm looking for as I look at your DCFs is what story you're telling about a company even if you don't claim to be telling one. So today I want to start off by presenting you with the numbers and evaluation and I want you to guess the story. This is actually an interesting way to connect stories numbers. If you look at the DCFs what's the story here. You ready? See here are the numbers I showed you. And as I give these numbers I'm going to ask you to think about the story that must be behind my numbers. I show you a company where I expect revenues to grow at 50 percent a year for the next 10 years. So that's what you see as a growth rate. I show you an operating margin of 20 percent in year 10 and that is twice the industry average. I show very little reinvestment over the next 10 years. And I give you a cost of capital of 7 percent which is significantly lower than the cost of capital of an average company. So that's makes Excel spreadsheet. Now I want to take those numbers and reverse engineer from those numbers. What kind of implicit story I must be telling you about the company. What am I telling you about this company. Is it a small company in a growing market or a large company in a mature market. What must my story be and what is the clue that gives it away. A 50 percent compounded annual growth rate in revenues you think about it basically means you're 50 percent over 10 years you've probably taken your revenue increasing it tenfold. Can it happen? Yes, if you're a small company in a large growing market. And if this is Volkswagen right now what should you say. Impossible story. Turn it back to me so there's no point even looking at the rest. So when I did a beta and I don't care. Because once your revenue growth rate has gone off the tracks the rest is going to go off the tracks as well. So it must be a small company in a growing market. Am I telling you anything about competitive advantages barriers to entry. I'm not directly telling you that but what am I telling you about the margin twice that of the industry which must mean that you have. A niche business but can't be a niche business that it's 40 percent 50 percent of your. Or that you have some competitive advantage that can allow you to charge more. Am I telling you something about the capital intensity of the business model. The fact that a very low reinvestment has been of some kind of business model that is capital intensive. Again if I did this with Volkswagen you're going to push back and say how the heck are you going to turn cars out from an app. I'd be interesting if you could maybe three dimensional printers. I have no idea. But it must be a low capital intensity model. What am I telling you I think about the product whether it's discretionary or not discretionary. I'm giving you really low cost to capital. You can dance around it and talk about Beta's and cost of debt. But the reality is we have a really low cost of capital it must be because you're in a business that is not discretionary you see that when we when you want to look at somebody else's DCF. If I'm doing the DCF you know what I want you to do I want you to get lost in the forest. 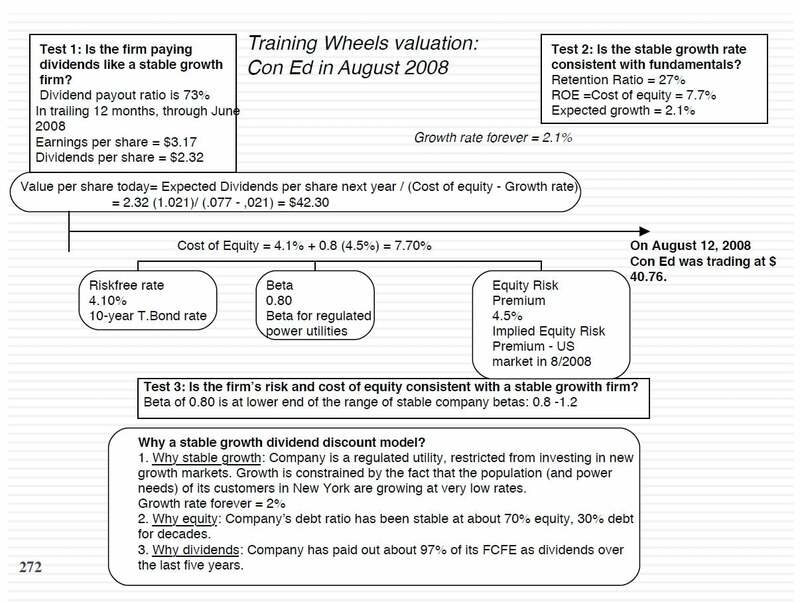 But ask me questions like Can you use a 48 percent revenue growth rate of 50 percent to 20 percent margin should it be 19 percent your current capital how do you computed because these are the numbers where I pull you into my turf. And I win every single time. My. If you want to really look at valuations and I the right questions What do you have to do is extract the implicit story and then put me on the spot. Is it a small company in a growing market if not the revenue growth doesn't work. What are the combat advantages of a hem and haw and say we were the first ones. It's the weakest possible comparative advantage you can take. I couldn't think of any other. We were that first. Then he was maybe a 20 percent margin doesn't hold up. So when you send in your Excel spreadsheet. I'm hoping you flesh out the details but if you don't don't be surprised the the ask you why are you acting like Volkswagen as a small company in a huge market. I didn't assume that but a 50 percent growth rate effectively does. You don't even have to put it in words your Excel spreadsheet tells me a story. And if you don't like that story I'm not the problem. You have a problem with your subs. You've got to work through the story that you are comfortable and that's why it's so good to flesh out your own story as you're putting in the numbers. Now could your story change. You would have turned in a story an evaluation this Friday right. Could it change next week. Of course, you could have been doing boring three weeks ago and took a look at how quickly that story changed.